Deadline for submitting your projects is Wednesday, September 3rd at 11:59 PM US Central time. This is Lynda hosting this week's Inspirational! Our theme this week is Stay Focused on Stamping Anything Goes! A stamped image must be the focus of your project, but the theme of your project can be anything you would like. Please be sure to put in your writeup what you stamped on your project so ti's clear where you stamped. Here is my project based on our theme this week. I used the image from the Life So Big set to create this card. I had this set out for our Naked Stamping challenge a few weeks ago and couldn't help myself but to make another card using the set, but pumping this one up a bit. I stamped the image into the bottom right corner of my kraft cardstock card. I then colored the image using my Copics. I then doodled the frame along the edge of the card. I then added white gel pen dots to emphasize the butterfly image and frame. Deadline for submitting your projects is Wednesday, August 27 at 11:59 PM U.S. Central time zone. Drea here hosting this week's Inspirational! This week I'm challenging you to stamp any image that has wings, (bird, butterfly, dragonfly, airplane, angel, etc.) or just add stamped wings to something or someone. 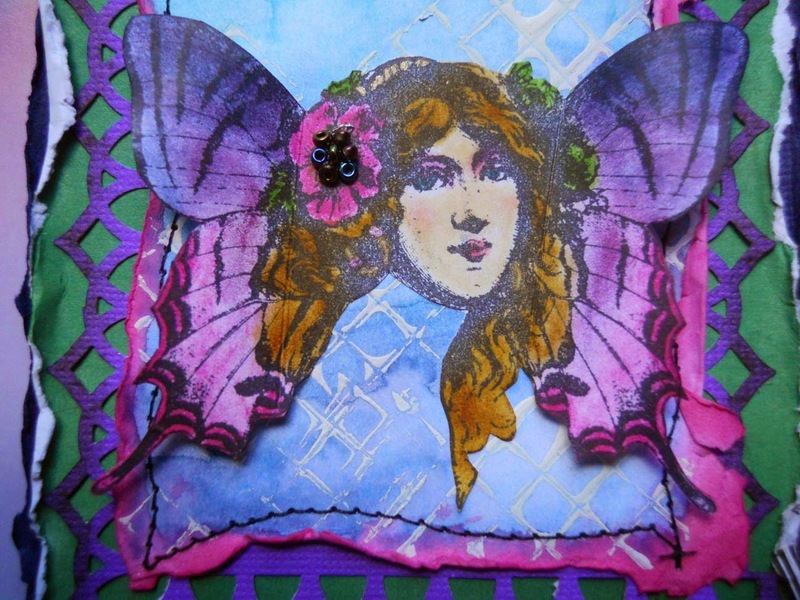 I created this tag and folded the butterfly wings out to give it more dimension. I started by creating the sky background by stamping the lattice with gesso onto white cardstock, using Vintage Background . Then I used some Distress Inks and used a Q-tip dipped in water to create clouds. I stamped the bird using Hope Perches, and the butterfly and sentiment with Beautiful Soul. I used Distress Inks and a gold pen to color my butterfly image, adding some beads to the flower in her hair. Deadline for submitting your projects is Wednesday, August 20th at 11:59 PM US Central time. This is Lynda hosting this week's Inspirational! Our theme this week is all about Marking the Spot: Bookmarks! It's almost back to school time and kids both young and old need bookmarks to keep track of their reading assignments. So my challenge to you is to pull out those stamps and stamp a bookmark of some kind. Remember that you must have stamping on your project. Here is my bookmark for our challenge this week. 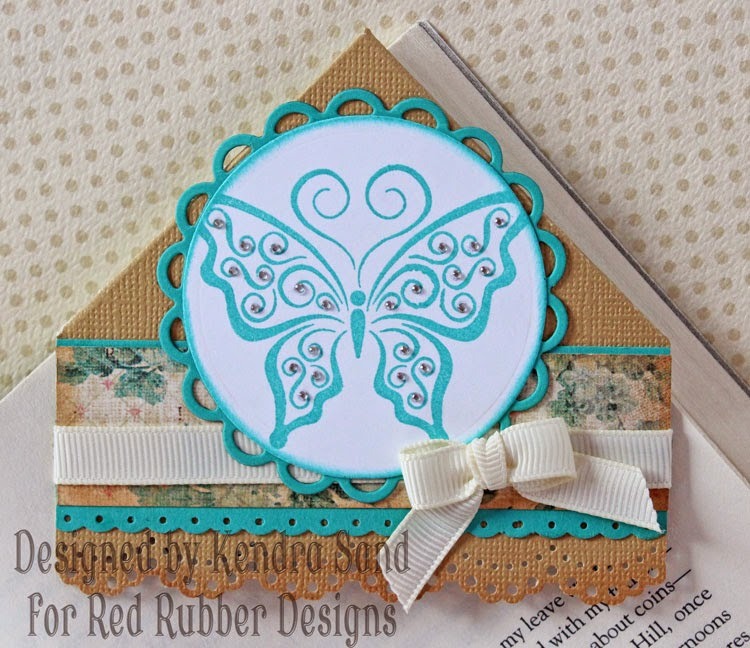 I first stamped the largest butterfly from the Flutter By stamp set onto the cardstock. I then created a mask by stamping the same image onto a scrap of copy paper and fussy cutting the image out. I then covered the butterfly with the mask and stamped the companion definition image from the Well Defined stamp set once over the butterfly image and then to the right and left of the image. I then trimmed the bookmark close. I then used my Copics to color the image in. I then inked the edges of the bookmark. I used a large holepunch on the top and added these fun fibers in a coordinating color to the top. Thank you to everyone who participated in our Inspirational #131: Naked Stamping! It was a tough one and I really appreciate those of you who tried it! Congratulations to the creators of our three Inspiration Projects for Inspirational #131! Carmen created this lovely card with different shades of blue. This is a great way to add depth to your stamping. Ann showed us that sometimes simple is good! 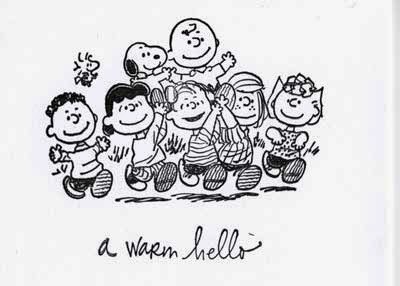 Her cute Peanuts characters steal the show. 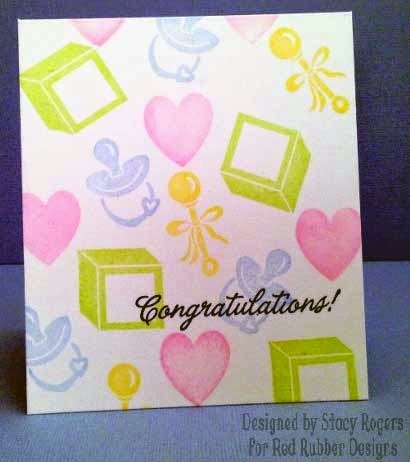 Stacy created a really fun background with just her stamps, using different color inks - isn't it adorable? There is still time to get in on our current Inspirational #132: Polka Dots, hosted by Kendra. 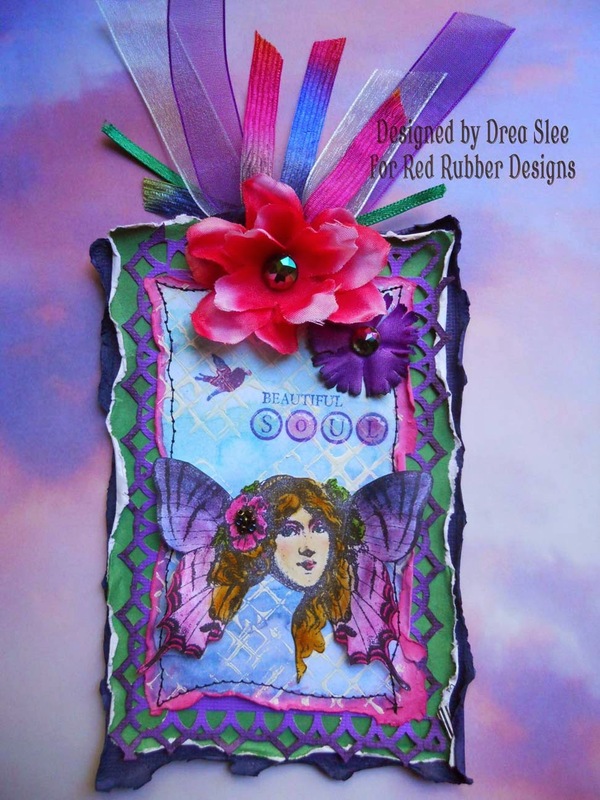 Be sure to check out her sample project which was published in Paper Creations Magazine! Please link up your project by 11:59 PM (U.S. Central time zone) on Wednesday, August 13th. 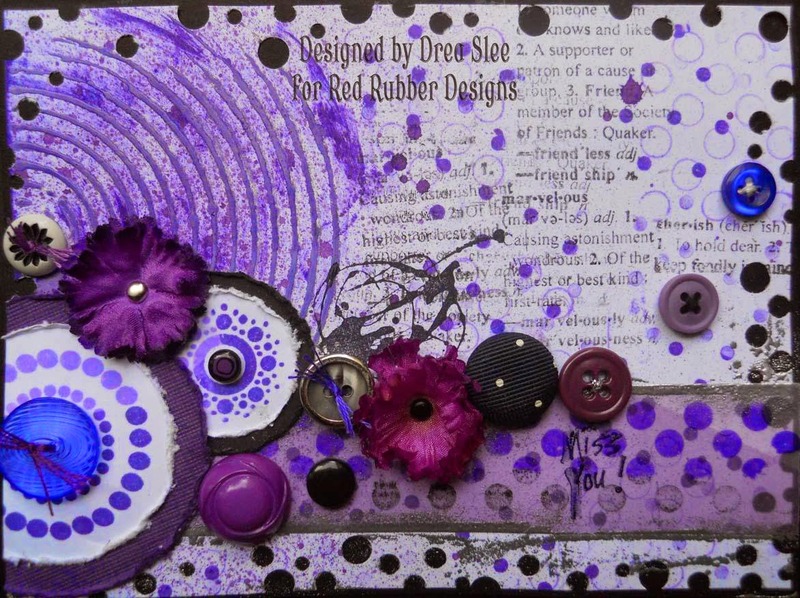 And don't forget our next stamping Inspirational starts on Thursday, August 14th! Won't you join us? Deadline for submitting your projects is Wednesday, August 13 at 11:59 PM US Central time. Our theme this week is Polka Dots! 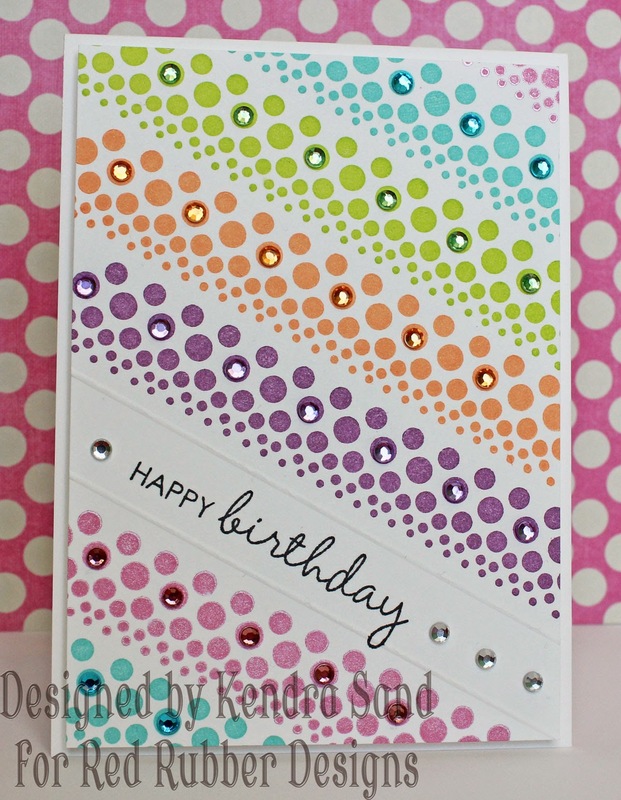 I challenge you to stamp polka dots on your card! LOVE all the bright, fun colored polka dots!!! I used the Lotsa Dotsa set for the polka dots! The sentiment is part of the Sophisticated Sentiments set! She used a bunch of fun stamps! She used Background Soup, Chicken Scratch, So Splattered, Build-A-Background, Well Defined Backgrounds and Lotsa Dotsa!! 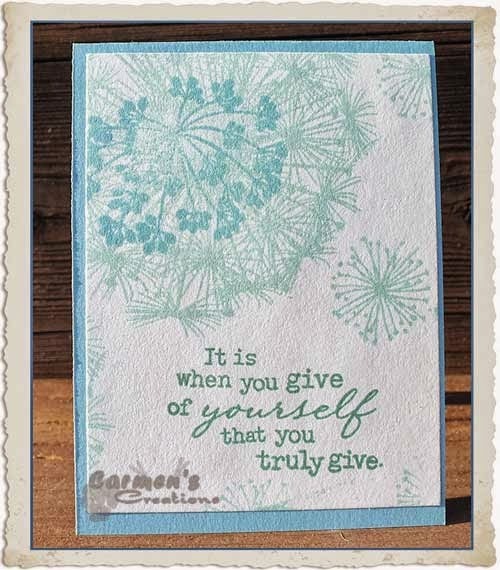 I wanted to remind you that our latest stamping Inspirational is still going on - I hope you get a chance to play along with us! It's a difficult challenge for many of us, but I do hope you decide to step outside of your comfort zone and give it a try. We have weekly stamping Inspirationals (challenges) every Thursday on the blog to help inspire you to pick up your stamps and use them! 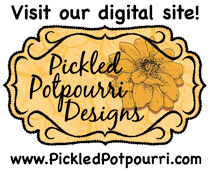 There are several ways to always get the latest Inspirationals and other info from our blog: Join us through Blogger, Follow us on Bloglovin' or Follow us on Feedly. You can also sign up to have our blog posts sent directly to your email. All of these links can be found in the right sidebar. Our Inventory Blowout Sale and our Bulk Paper Sale are in their last month! By the end of August, these fabulous deals will be GONE, so get them while you can. All items are on their final markdowns and let me tell you, the prices are the best I've ever seen anywhere. I hope you are able to get some good deals for your crafting and stamping projects. The inventory reduction sale started out with over 600 items and is now down to under 350. You can get many items for up to 95% off of retail - now that's a good deal! Our bulk paper sale consists of a box full of 12" x 12" patterned designer paper - at least 2" high worth! All for only $25 - which includes shipping! You can find more details on our paper sale at this link. 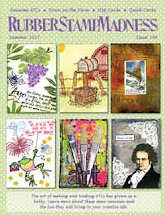 And I can't forget to mention our Clearance Stamps - some of our most popular unmounted rubber stamps are up to 60% off, while supplies last. These stamps won't ever be available in rubber again and they are going fast! Did you know about our Spotlight Stamp? We always have a stamp set in the Spotlight that you can get for 40% off with any order. It changes on a regular basis, so keep an eye out! You can find our newest stamp releases in our Featured Stamps section. I try to add new cling-mounted rubber stamps to the store every couple of weeks. 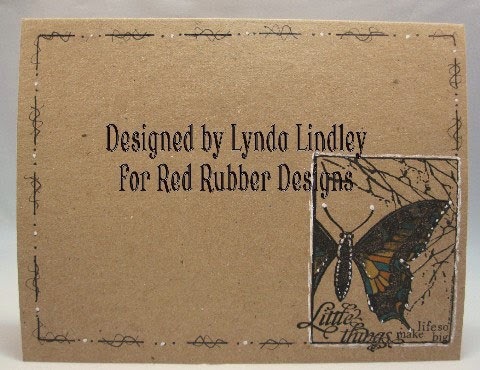 Red Rubber Designs offers a variety of rubber stamp styles - there's something for everyone! Don't forget to LIKE our Facebook page to get updates on special sales, our weekly Inspirationals and new stamp releases. Now... have you submitted a project to our current Inspirational yet? Deadline is this Wednesday - come stamp with us!